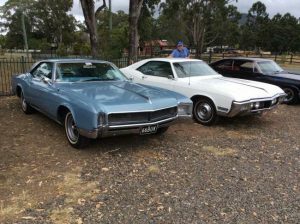 Under cloudy skies and light rain, an enthusiastic group of ROA and Buick members gathered at Cameron Park, Booval for our combined ROA/Buick Club Run in the country. 27 members, guests and families braved the wet conditions which at that point, looked like continuing. We were very p leased to see some of our new members come along and join us for the day – Terry and Barbara Searle and team, Adam and Sharon Woodley with Jake and Chevy – welcome to the Buick family of friends. 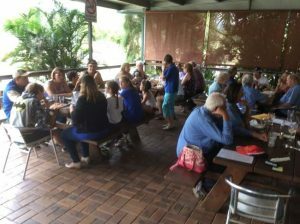 A slight change of plans due to the weather saw us have our club meeting in the shelter at the park. Although the rain eased off, we all decided to have morning tea before we left instead of our planned stop in a park in a country village on the way to our lunch destination. After this, we headed off for our run, following our run notes provided. Thankfully the rain stopped as we drove through Ipswich and out through Peak Crossing and on to the town of Boonah. Our destination was Mt. Alford, some 15 kl. past B oonah. The road was good, not much traffic and the rain had stopped – hooray! We all made it safely to the Mt. Alford Hotel (although some arrived a little late after missing a turn). contained in previous Australian Riviews – so if you read your Riview you would have had a great shot at the answers. Whilst no one got all the questions right, the competition was won by Adrian Dearling with runners up, Paul and Christine Dearling and Terry Searle. Rivieras on the meet included John and Laurene’s lovely ’65, Peter and Sandra’s ’68, Terry Searle’s ’66 (a new one for the boys to look at), and my Wedgewood blue ’64. 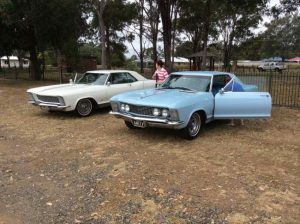 Unfortunately John Barker’s Riviera was temporarily off the road and Adrian could not bring his ’65 due to having another commitment following our run. It was also great to see the other Buicks on the run including Dave and Colleen Wilson’s 1934 and Adam and Sharon’s Wildcat (another new one for the boys to look at). Despite a cloudy and wet start to the day, everyone seemed to enjoy themselves and there was lots of chatting over lunch at the pub. Thanks to everyone who came along. It was especially nice to meet our new members and see their cars.